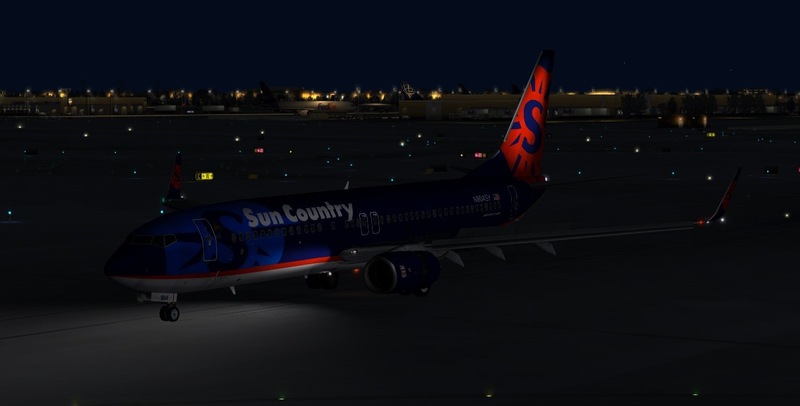 As many BVA members know, Boston Virtual ARTCC has been proud to offer the community an integrated and easy-to-install set of models that are used to depict the other aircraft you see while flying online. Clearly, the aircraft, scenery, ATC, and all the other awesome stuff about VATSIM is enhanced even further with realistic aircraft depiction. When you are flying, nothing is worse than seeing a default FSX A321 in place of what should be a British Airways 747. Where’s the immersion in that? Although numerous freeware AI packages have become available to the public, most are complicated to install, or are limited in the models they support. There has also not been a model matching package we are aware of that has models supported by Prepar3D v4. Until now. 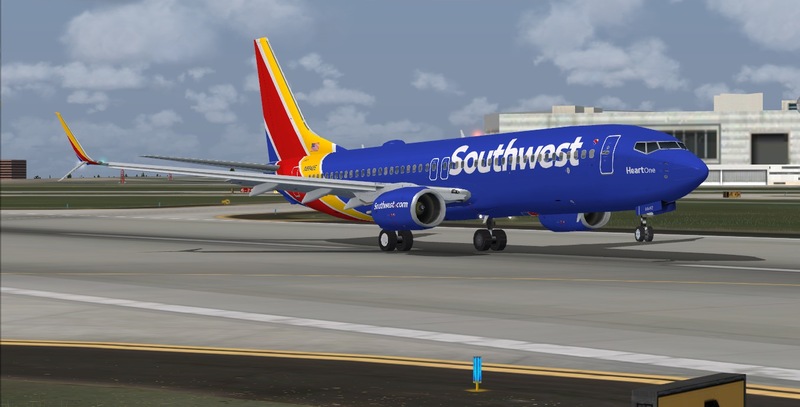 Boston Virtual ARTCC is proud to announce BVAI, a new, free model matching solution that supports FSX, Prepar3D v4, and other Microsoft-based simulation platforms. The package will be available for free. A top of the line model matching system. An installer that will ensure your BVAI is installed correctly depending on your simulator, with a manual installation option for people who prefer control over their setup. Regional airline support that model matches based on callsign and flight number. A feedback system that allows for livery requests. Frequent updates. This is will not be a ‘one and done’ project. As Flight Sim AI continues to improve and evolve, we will provide updates and hotfixes. Why BVAI? Our goal from the beginning was to make a freeware AI package that has working aircraft for FSX and P3D v4, and is supported by the creators of freeware modelers and repainters. Nowadays there are different resources to make your own AI package. We have done the leg work to ensure that every single aircraft type will be depicted in your sim, regardless if you are using FSX or P3D v4. So where do we stand now? We are almost ready for release. Last night, we sent a close-to-final beta version BVAI to our testers with overwhelming success. We are developing the installer, and running through the last stages of testing before we release. We are grateful that the AI community has been very supportive of this effort. We’ve been reaching out to modelers and painters to get permission and approval to use their files in this package. With just one exception, everyone has been willing to allow us to use their freeware work in this project, resulting in such an all-encompassing package. As a final note, we would like to stress the freeware aspect of this package. Currently freeware AI aircraft are scattered around the internet for download. The individuals that have created and painted these aircraft have been more than generous to allow us to use them within BVAI. We have worked extremely hard to compile everything into one easy to install package that works with Vpilot and Vatsim. We recognize the importance of a package such as this as it is an aspect of flight sim that is missing. We do realize there has been quite a bit of hype and questions around this product since it was previewed. Hopefully this answers your questions. It has been quite the journey making this package, and we can’t wait for it to go live! Some more pictures from testing today. A quick note concerning the regional airline model matching as I've recieved a few questions about it. One aspect of BVAI that will be implemented is regional model matching. As a frequent regional flyer myself, nothing bothers me more than seeing a default aircraft in the place of what should be a regional jet. It’s really an OCD thing for me. I can’t be the only one! Take for example pilot DAL _ _ _ flying a CRJ7. I have blanked out his full callsign for obvious reasons, but you can see this pilot filed as a DAL CRJ7 instead of using the ASQ, GJS, or SKW callsigns. Normally, this would result in an error because Delta airlines does not own any CRJ-700’s. Expressjet, Skywest, and GoJet do. We have written the model matching code to recognize this fault, and display the correct livery despite this captain flying a regional plane as a mainline callsign. The E175’s have also been addressed. 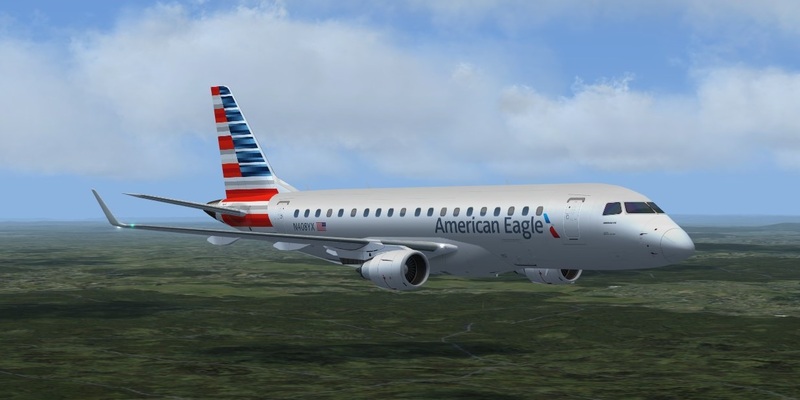 If someone files as a Republic Airlines E175, BVAI model matching will depict the correct livery depending on your flight number. 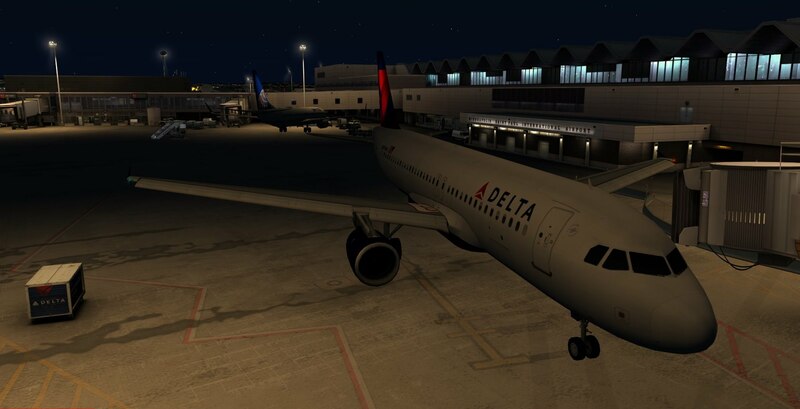 RPA4537 from PHL-SYR will show in your sim as an American Eagle E175, while RPA6071 from LGA-BOS will show in your sim as Delta connection E175. If you file as an E75S or E170, BVAI model matching will depict an E175 with normal winglets. If you file an E175 or E75L, BVAI model matching will depict an E175 with long, new winglets as the picture below suggests. Diving further into the regionals, Republic Airlines Delta does not have E175’s with long winglets. If a pilot files as RPA6071 aircraft type E75L, BVAI model matching will recognize this error and depict an E75S, or short wingletted E175. We haven't gone too far into this aspect of model matching as someone filed as an Embraer 175 should be replaced by a CRJ-700, even if they are using a callsign who's airline does not have that specific airplane in their fleet. If that makes sense. Finally, BVAI model matching will depict all other regional aircraft based on callsign, aircraft, type, AND flight number. If a pilot logs onto the network as an Expressjet CRJ7, the livery depicted will depend on the flight number. ASQ2675 CRJ7 will model match as an American Eagle Expressjet CRJ7, while ASQ5599 CRJ7 will model match as a Delta Connection CRJ7. This feature will be implemented in the release candidate. Although this is more prevalent in the United States, it also applies around the world with SHT as British Airways, KLC as KLM Cityhopper, and HOP as Air France HOP. If there is any missing that you would like to see we can definitely add it within reason of course. One thing to note, this will not work if you have multiple AI Packages installed. There are too many variables going on to match the correct livery with the callsign and aircraft type. We’ve found through beta testing that any additional packages installed will interfere with our model matching file, and cause Vpilot to crash. You are, however, more than welcome to at least try it and see if you can do anything to make multiple AI packages work in coexistence when BVAI is released. The installer will serve as an easy to use tool to install, and update BVAI. When new versions become available you will notice a number discrepancy between "My Version" and "Latest Version." When this happens just press the update button, and wait a minute or two for BVAI to be updated. P3D users will find additional functionality as they are able to place BVAI anywhere they desire. 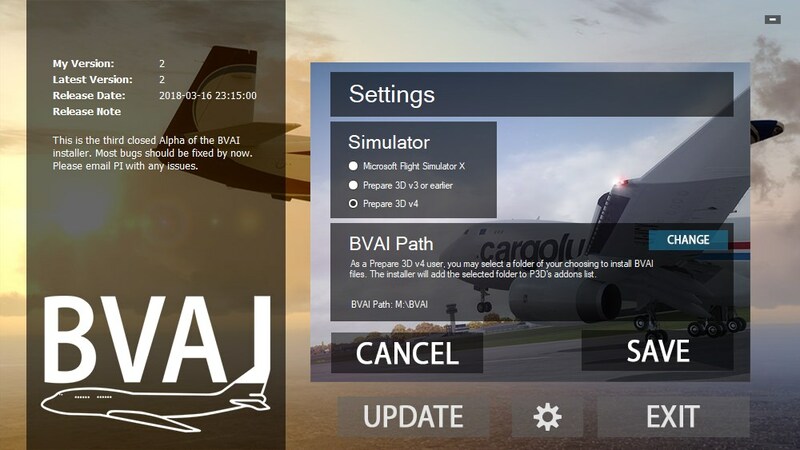 The installer will create an addons.xml file that connects the BVAI package to P3D V4, without the package hogging up space in your P3D main folder. FSX and FSX steam users will not benefit from the same functionality as FSX does not utilize this feature, however BVAI will install just fine into the main FSX folder. For those FSX users that wish to place the BVAI package into somewhere other than the FSX/Sim Objects folder, you will have to edit the fsx.cfg to reflect this. We will provide instructions on how to do so. Also note, the Release date on the picture above was the release date of the last beta version. With regards to texture issues, the past two weeks were spent heavily addressing the issue of P3D dynamic lighting and aircraft night lighting. 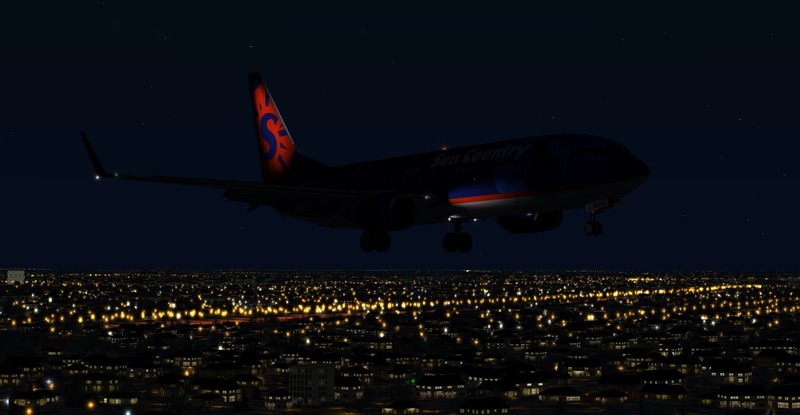 There were some issues with night lighting in certain aircraft, and we believe that has been fixed. Additional beta testing will confirm this. When you are at an airport that contains scenery with dynamic lighting, this lighting will reflect realistically off of the AI airplane. In addition, any taxi lights or landing lights will reflect off the AI aircraft also. Some AI aircraft such as the 777 will show the landing lights as being on at night at the gate without the aircraft actually producing any light. This is one drawback when using older freeware models as the night texture only shows one "scene." The aircraft will still show a taxi light and landing lights when the pilot decides to turn those on, and these will reflect off of your aircraft. 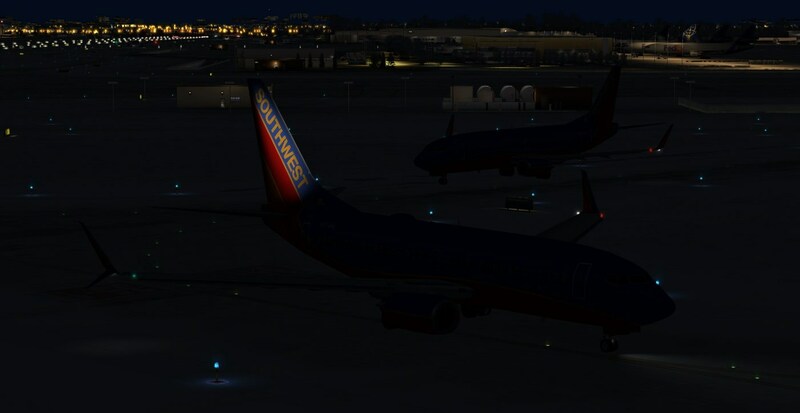 Newer AI aircraft made for FSX and P3D such as the 737 series, Airbus series, 747 series, and 767 series will only show taxi light and landing light effects when that pilot turns those lights on. Vpilot does an excellent job telling the sim when another pilot turns certain lights on or off. You can see this difference between the Alaska 737-800 taking off and the Delta 767 taxiing out versus the Turkish 777 and British Airways 777's below. As a final note, I do welcome any feedback or suggestions. Just keep in mind this is a freeware product. We can only do so much before it either starts to affect performance. Currently, there is a total of 2,000 liveries, and 178 aircraft models. As BVAI updates progress, this number will probably get larger as new repaints are added, and new freeware AI aircraft models become available. There are still some bugs present within these pictures. Most of the aircraft do not have proper navigation lights displayed. We are aware of this, and rest assured this will be fixed. That's why we have an excellent beta team. After stress testing BVAI during tonight’s ZMP FNO, I think it’s time for a good update. Focus has shifted from the actual AI to the installer, or as I call it the BVAI Operations Center. The goal is to remove the manual installation aspect of BVAI and have all updates and hotfixes download and install at the push of a button. One worry going into this project was the number of support tickets that would result from improperly installing BVAI. The process is quite involved, and very easy to screw up. Szymon has taken the time to create a program to make this process as easy and automated as possible. So… I give you the BVAI Ops Center. At first glance, it seems very straightforward. You can press the “Update” button and have the program automatically scan and update fixed files. This is essential as even after release there will still be minor bugs that need fixing. Also, for those who have requests for certain airlines, aircraft, etc… These can be easily implemented. When there is an update, you will be prompted to do so when launching the Ops Center. The Update button is also used to install BVAI at first use. The addition of new models, liveries, and general fixes will take about two minutes instead of downloading and manually replacing files. Moving on, the settings button allows you to dictate where BVAI is installed. For P3D V4 users, this is a welcomed edition as it does not have to go into your main P3D folder. As you can see, I have my installer pointed to a separate hard drive. During install, the BVAI installer will create an addon.xml and place that into your P3D Add-ons folder which will connect the main BVAI folder to your P3D. Those who use FSX will not be able to enjoy this luxury, but will still be able to use BVAI. Szymon has been adding new features during every new beta release and requests are welcomed. Another focus of BVAI has been the night textures. During the daytime, BVAI has been very stable. After the release of P3D v4.2, there was an issue with dynamic lighting on some aircraft. This issue has been fixed, and we’ve found BVAI performs better under 4.2 over 4.1. Tonight’s ZMP FNO provided a great stress test for our beta testers to make sure there are no further issues. As you can see from the pictures below all aircraft will properly depict landing lights, logo lights, beacon, strobe, and nav lights. These lights are controlled through Vpilot. When another pilot turns on a certain light, Vpilot will recognize this and depict this change on the AI. Certain aircraft such as the 787 and A350 will have LED lights. You’ll definitely notice the difference. There seems to be a bit of confusion with regards to how BVAI is run. In order to use BVAI you have to use Vpilot and have to be logged onto the Vatsim network. If you are just flying around in free flight you will not see any BVAI aircraft because there are no flight plans installed. Vpilot provides an excellent platform for model matching, and the use of Vatsim is pretty obvious. As for a timeline, I really can’t give an exact date. Through the beta testing process, we are still discovering and fixing bugs. Keep in mind this is a freeware project, and the team is rigorously testing and fixing BVAI in their free time. We are aiming to have a public beta out before Cross the Pond. Until then, keep an eye on the forums. The next update will most probably concern instructions for downloading the public beta! Finally, it has come the time that our beta testers can no longer break BVAI. By that I mean for the past four months we have done everything possible to find and fix issues that lie within BVAI. Everyone at our team has done a fabulous job identifying and reporting issues from large to small. We’re at the point that we need more people using the program in order to find hidden issues. The version we have currently is very stable with no reported issues in the past three weeks. What better time to test out BVAI than tonight’s FNO, and other weekend events? Just a few points before I give you guys the link. 1. If you are running any other freeware AI within your simulator to depict AI on Vatsim, I would recommend deleting it. You are not required to delete it, and BVAI should work just fine alongside other AI packages. Just to avoid any potential conflicts that we have not found during the beta testing process. 2. After downloading the BVAI Operations Center, press install and run the setup.exe as administrator. You might get a windows defender message.. just bypass this by clicking run anyway. This message comes up because we are not yet a certified developer yet. 3. For P3D V4 users, I would highly recommend that if you choose to install it into a location other than the default appdata, create a BVAI folder and point the installer to that location. I have mine right now on my "M" drive, and the installer is pointed to M:\BVAI. Some people created a BVAI folder in their Lockheed Martin folder and installed it into there too. Whatever works best for you. 4. While installing BVAI, it will show "My Version" as -1 with the latest version as four (or higher than that). This is completely normal. -1 really means you do not have BVAI installed yet. Once you install BVAI, that -1 will change to whatever the latest version is. 5. After installing BVAI, all you have to do is log into Vpilot, go to Settings\Model Matching\ and Custom Rules. 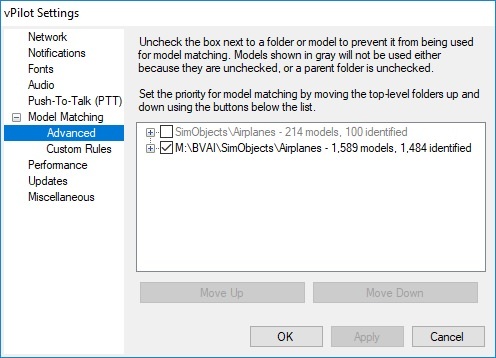 Add the BVAIModelMatching.vmr located within your documents\Vpilot Files folder. When you click the advanced tab it should identify BVAI\SimObjects\Airplanes and something like 1,500+ models. Also when clicking the Model Matching tab again you should notice right around 1,500 models identified under the Results column. Default Model can be whatever you wish. 6. Update frequently! The update process is very simple. Once a week click the BVAI Operations Center, run it as administrator, and it will prompt you to update BVAI if there is an update available. Do not delete the setup.exe as it serves as a backup way to access the BVAI Operations Center. I will be online flying tonight into the FNO. Not sure what callsign I’m gonna use yet. You’ll see in my remarks “Beta testing BVAI.” You are more than welcome to PM me with any quick questions or comments. If it’s working great for you I’d love to hear that too. If you have any pictures you would like us to include in a gallery on the BVAI website, please e-mail them to me. Final note, thousands of hours have gone into making BVAI as you see it today. It will always remain an easy to use freeware solution to Vatsim Ai traffic for the benefit of the community as a whole. Also, keep in mind BVAI is still in the beta testing process. This is not a perfect full release version. There may or may not be issues. If you encounter issues that you can pinpoint to BVAI please let us know using the support form on the BVAI website. That being said, have at it! Just under one day into the release of open beta BVAI, and we are very pleased with the results. A few of you have sent us feedback regarding certain issues after installation. I would like to quickly expand upon a common issue. After you install BVAI using the BVAI Operations Center, you are not done yet. You may notice that when you load up in flight sim and log onto the network, you do see aircraft models, but these models are either all white or only showing specific liveries. Obviously, if someone is loaded in as a B738 with the callsign, “DAL” and it shows up as a white 737-800, there is something wrong. After the installation of BVAI, please ensure the following within Vpilot. 1. Load up Vpilot, go to settings, and press the Model Matching tab. Make sure there are over 1,000 models found. If there are only 200 or so models found or identified, Vpilot is not recognizing that BVAI is installed. a. If there are only 200 or so models found or identified, ensure you have the latest beta Vpilot version. Older Vpilot versions will not recognize the addon.xml that P3D V4 uses to connect addons to the simulator. b. P3D V4 users, please be sure you have the latest Beta version of Vpilot installed. 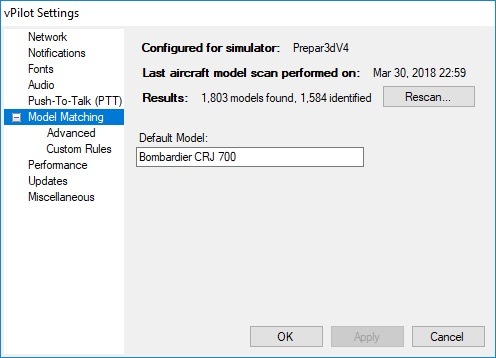 v2.1.10 Beta adds the ability to detect SimObject paths via the addon.xml files, which we use to connect BVAI to P3D and Vpilot. c. If you update Vpilot and you still only see 200 or so models, please contact us using the feedback form on the BVAI website. 2. Next, click on the Advanced tab under Model Matching. Ensure BVAI\Simobjects\Airplanes is checked. There may be other AI packages under this tab if you have them installed. This is completely normal. If you do experience issues with conflicting between BVAI and other AI packages you can either untick these other packages under this tab. 3. Finally, something a lot of people have forgotten. 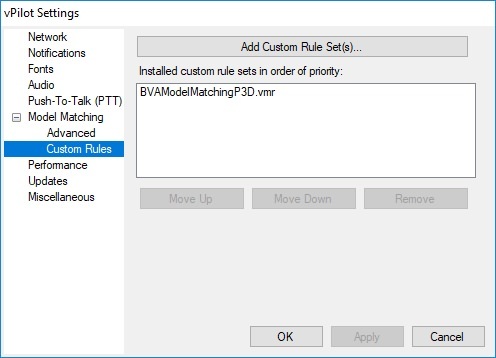 Under the Custom Rules tab, ensure you have added your BVAIModelMatching.vmr file. As you can see from the picture below, I have added the custom model matching ruleset and it clearly show in the white box. a. To add the BVAI model matching, press the “Add Custom Rule Set(s)” button, and navigate to your Vpilot Files folder. This folder is usually found under Documents\VpilotFiles. You will notice a BVAI folder within this folder and a VMR file within this folder. Add this VMR file to your Vpilot, and apply. We do understand a lot of pilots fly for fictional virtual airlines. Currently, 99% of VA’s will display a white version of the aircraft that pilot logs onto the network as. We plan on adding virtual airline model matching as time goes on. Another point I cannot stress enough. Be on the lookout for updates to BVAI at least once a week. It’s soo easy! Just open the BVAI Operations Center, and check to see if your version matches the latest version. If it doesn’t, just press that pretty update button and grab a drink. It’s all automated. Although we’ve done our best to include all major airline liveries, we may have missed some. So far in the past 24 hours since release, we’ve only had one repaint request which was added and will be in the next update. I’ll leave it up to you guys to guess what it is. Although interesting, we will likely not add a livery for airlines that have one aircraft in their fleet. Airlines like British Airways Cityflyer with their fleet of E175’s will definitely be added as a lot of people fly them on the network. Hint hint. Adding liveries takes up space, which increases loading time. Although one livery may not make a difference, it adds up over time. Before you request a repaint to be added via the feedback form as yourself, Do a lot of people fly this on Vatsim? We will look at Vatsim statistics to determine if a request is essential. Fictional airline to model requests will not be so important to us. We will not add an American Airlines A380 repaint unless there are a lot of people flying American A380’s on the network everyday. An example of this is the British Airways 737-800. We noticed a lot of people fly this airline/model pair, and it was annoying loading up on the ground in Heathrow or Gatwick to see a bunch of white BAW B738’s… So we added it. Some users have reported waiting an hour or two for BVAI to install, and others have reported that it takes less than five minutes to download and install. This is not only dependent on your internet speed but also the amount of traffic on the BVAI server. At its peak, there were so many people downloading BVAI that it took upwards of an hour. Right now at midnight, it’s taking a few minutes. My only advice is to give it time. If it’s possible, download and install BVAI during off-peak times (i.e. early in the morning or late at night). I assure you the update process will never take this long. Pretty self-explanatory. If you are experiencing an issue, please report it using the feedback portion of the BVAI website. Any issue that is reported and fixed is very helpful to us. We can, therefore, make strides to ensure no one else has similar issues with future updates to BVAI. With that said, Happy Easter weekend everyone! If you have any pictures that you would like to see in a gallery on the BVAI website please feel free to post them. -Added DLH B772 and B77L model matching. -Fixed CFE/BAW E170/E175/E75S/E75L textures and model matching. -Fixed Lear 35 default texture in P3D V4. -Replaced CRJ9 with Alpha India Group CRJ9, and added liveries. -Fixed Cape Air Cessna 402 prop textures. -Fixed Cessna 402 model in FSX. -Added Easyjet Switzerland (EZS) model matching. If you find any further errors please continue to submit them using the feedback form on the BVAI website! 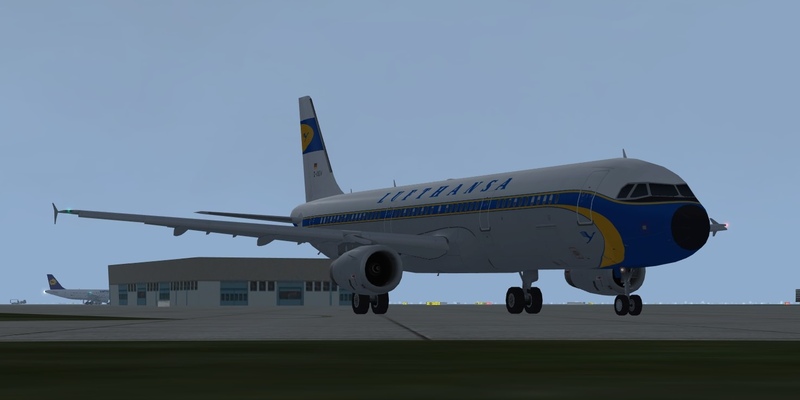 Added A321 NEO to BVAI! Added Alaska A321 NEO liveries (three in total). Reworked Alaska (ASA) and Virgin (VRD) model matching. Updated prop textures on Cessna 402, King Air C90, King Air 100, and King Air 200. Fixed E145 model matching typo. -Fixed numerous aircraft.cfg errors to improve performance and stability. -Fixed E75S/E170 default model matching errors. -Fixed Jetblue E190 model matching. -Reworked Norwegian Air Shuttle and Nortrans 737-800 model matching. Added a few extra liveries. -Updated Qantas/Q-link model matching code. -Added QFA A320 model matching code. -Added Wizz Air New Livery A320 and A321. -Added Lufthansa 747-8, A320, and A321 new liveries. Cross The Pond Note! : Please update to version 7 before Cross The Pond if you plan on flying during the event. Once you have updated to version 7, do a quick test run of your flight simulator. When you open flight simulator, there should be zero errors popping up that have to do with BVAI. Load into free flight at a busy airport, and make sure you see correct aircraft and liveries displayed. If you are having any issues, please contact us using the BVAI website feedback form. Also, please be cognizant of how many aircraft you want to display. Under Vpilot settings/Performance, I'd recommend decreasing these two settings just for Cross The Pond. You computer will take a performance hit when trying to load over 1,000 AI aircraft. Instead, limit the distance to <40nm, and the maximum aircraft to display to 100. Feel free to mess with these settings however you wish. I apologise for the timeliness of this post/update. I was all ready to post this morning but I got called into work last minute. Anyways.. Some of you have been wondering why there’s been no update within the past few weeks. We received a lot of positive feedback during and post Cross The Pond, which allowed us to make a few changes. Members following our forums have likely been hearing about BVAI, a new model matching solution for VATSIM pilots that is currently in open beta testing within the flight simulation community. As we continue to develop the product, we have decided to begin working with Ryan Parry, creator of vPilot AI. vPilot AI is a similar package that has been available to VATSIM members since as early as 2015. The new free product, to be called Fly Ai (FLAi), will bring the same level of immersion offered by vPilot AI, with the easier installation and incredible ops center of BVAI, and a team of people working to keep the package up to date. That means more updates, more often, and a much more realistic experience for everyone! In addition, we'll be offering a set compatible with FSX, P3D v1, V2, V3, and V4, as well as a second P3D V4 only package that will include P3D v4 models and dynamic lighting on select models. 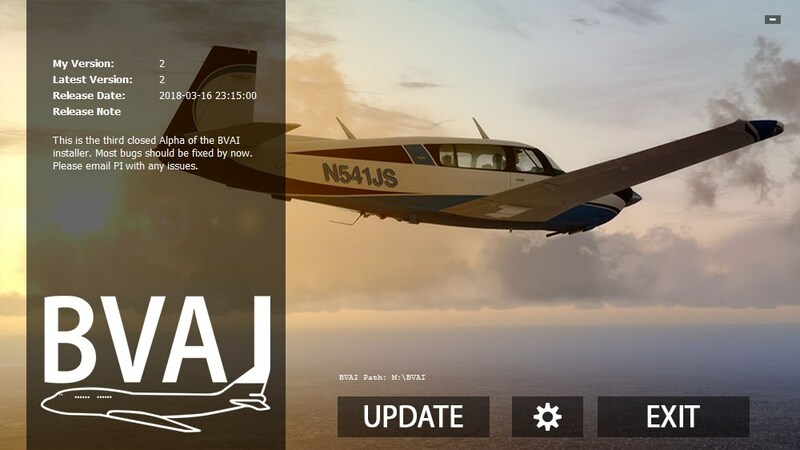 The aircraft models and liveries that are currently available in BVAI or vPilot AI will all be available as part of FLAi. There will be no loss in liveries or aircraft models. Instead you will notice better performance with the optional dynamic lighting, more updated aircraft models, and more liveries. The only loss will be the name "BVAI." I know, I liked that name too because it had BVA in it but we'll get over it together. So what does that mean for current BVAI users? If you are a current beta tester of BVAI, no action is required. Once we’ve released the first beta version of FLAi, we’ll let you know. For existing BVAI users, the installation process will be simple: run the BVAI Operations Center, and you’ll be upgraded to the first beta version of FLAi. This update merging the two packages will likely be introduced with version 8. If you’ve had BVAI installed for a while you probably know how updates work. It will be the same exact process. For now, users of VpilotAI or BVAI can remain using whichever version they are currently running. If you haven’t yet downloaded BVAI, we recommend waiting until the first stable version of FLAi has been released. At that time, we’ll publish more information about how to download and install the new model matching package. If you do have any questions, please feel free to contact us using the regular feedback system. After a period of silence and hard work, we’ve come to a point where we can finally talk about this long-awaited update. I know the whole process of moving from BVAI to FLAi has been confusing, however, I hope the work speaks for itself. So what’s new? A lot of people have asked us this question. Post installation you will notice there are not many differences. The same liveries you’ve come to know and love are still there with the same models for the most part. We’ve added just shy of 1,000 liveries to the already substantial database of airlines. In total there are about 4,700 fixes, updates, changes, etc. Although you might not notice the difference upon first startup, over time the changes become apparent. Under the hood, we’ve gone through every model and texture, every line of model matching code, and fixed quite a few issues that persisted in both BVAI and VpilotAI. One large difference you will notice right away is that you are now able to select whether or not you want Dynamic Lighting to interact with the AI. For those who use P3D and have dynamic lighting disabled due to performance issues, you can now disable this feature in order to gain a few extra FPS. For those who wish to use Dynamic Lighting with FLAi we’ve included scripts that control the dynamic lighting’s effect on the AI aircraft. The merging of VpilotAI and BVAI was no easy feat, however, we believe the additions we’ve included and the problems we’ve fixed will improve your simming immersion. Existing BVAI users please don’t panic! You will not have to uninstall BVAI manually. Please allow the FLAi Ops Center to take care of that for you. Upon downloading and starting up the FLAi Ops Center, it will automatically find your BVAI installation and remove it for you. If you installed BVAI manually, the installation will allow you to choose where it is installed, and will delete it for you. If BVAI is not deleted in its entirety, there may be conflicts when starting up your simulator. After BVAI has been successfully deleted, the FLAi Ops Center will proceed to install the new FLAi package based on the settings you choose. This process should take about ten minutes or so, maybe a bit longer if a lot of people are downloading it at once. As always we have the feedback system in case you run into any trouble. Evan, Ryan, Szymon, and I will be more than happy to field any questions. For now, we are still considering this as an open beta. We need to make sure any lingering bugs are worked out before we consider FLAi released. We’re very excited about this new release and hope that you will love using it, just as much as we did creating it. Let us know what you think! DISCLAIMER: Please note that reverting back to BVAI or VpilotAI will not be possible after you have uninstalled it. Please test this package before flying to ensure it works properly! 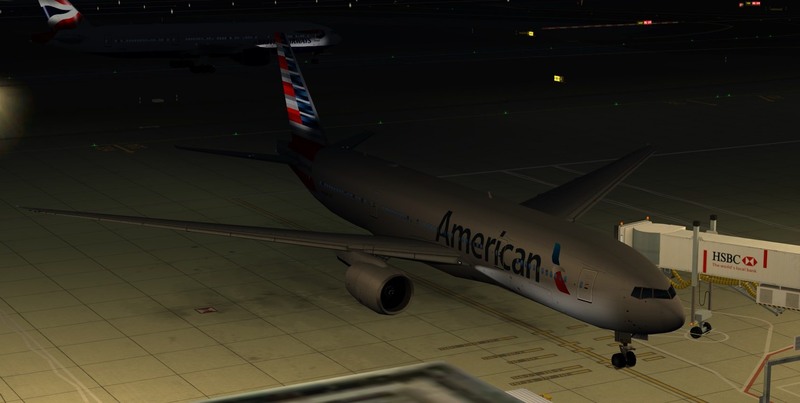 Load up at a random busy airport, log onto VATSIM, and make sure aircraft are being depicted.